Lovely feature in the Times "Escapes" section last Friday on all the old-time playhouses still operating in nearby Pennsylvania--such as Lancaster's Fulton, above. Far from being cobwebby vestiges of gilded glory days, the Fulton and other historic theaters in neighboring towns are vital, thriving performance-arts centers. They have undergone multimillion-dollar restorations and now offer full seasons of touring Broadway shows, pop concerts and local theater. State-of-the-art audio, lighting and projection systems have been added, and backstages and fly spaces have been expanded to better accommodate elaborate show sets. Nice to see folks taking care of these places. The article comes with a slideshow of beautiful shots from NYT photographer Michael Falco (see above). [T]rain tracks once ran past the stage door of the Fulton Opera House. A century ago, the Fulton was known as the “queen of the roadhouses,” and trains hauled traveling shows of enormous size right up to that stage door. A 1907 production of “Ben-Hur” featured a cast of 300 and had elaborate sets that were loaded in from boxcars behind the theater. The show’s high point, according to news accounts from the time, was a chariot race. For this scene, four horses pulling two full-size chariots were led onto a massive treadmill at centerstage. The horses galloped at full speed, while a painted panorama of stadium spectators was reeled on an “endless belt” in the opposite direction to create the illusion of motion. Kinda gives a whole new meaning to the idea of the "bus & truck show," eh? Here's a trivia question, btw. 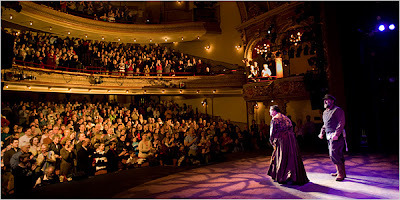 And one I don't know the answer to!....What is the oldest operational theatre building in NYC? If not one of the Broadway houses, I'm tempted to guess the "New" Victory Theatre?